YOU Netflix season two: Everything we know about what's to come. SPOILER ALERT: This story contains spoilers for YOU season one. It’s only been a week since Netflix dropped its latest bingeworthy show YOU, but if you’re anything like us you’ve already devoured all ten episodes – in a single sitting. The trashy but oh so addictive psychological thriller, based on a novel of the same name by Caroline Kepnes, follows bookstore manager Joe who quickly becomes infatuated with aspiring writer ‘Beck’ after crossing paths with her. 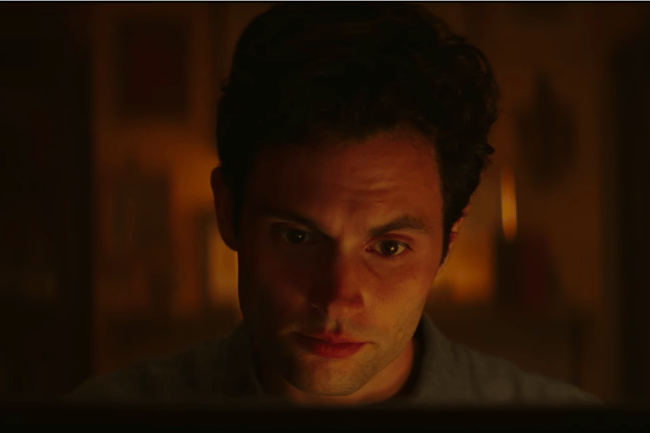 Joe (played almost too well by Penn Badgley of Gossip Girl fame) will stop at nothing to get Beck (Once Upon a Time‘s Elizabeth Lail); stalking her online to gather information to get close to her, stealing her phone to keep an eye on her, lurking outside her apartment window (and as you do, casually jerking off…), as well as removing every obstacle – and person – in his way to be with Beck forever. And ever. Yes, that even includes murder. It was nail-biting stuff, right till the very end, and naturally now that’s it over, we are simply dying for more. Well, a second season was actually already announced by YOU‘s former home on US network Lifetime a while back, but as of December Netflix has full reigns of the show and season two will be premiering on the streaming giant. Who will be returning to Season Two of YOU? All we know so far is that Penn Badgley will be reprising his role as terrifying psychopath Joe as he heads to LA and begins his search for love – again. Given the high body count in the first season, it’s unclear if anyone else will be returning so it’s likely Joe will be meeting a whole new set of people to creep out and most likely… murder. Oh and remember Joe’s ex Candace, who we only discovered was actually alive and well at the end of the first season? Gamble told Variety that she “does indeed have a role in season two”. Juicy stuff. What will happen in YOU‘s second season? It will be based on Kepnes’ follow up novel called Hidden Bodies and based on the synopsis, we are in for a ride. However, Gamble told Variety that they are planning to “diverge a little bit more from the second book than we did from the first, which was a very tight examination of this one relationship”. But she said they have been in continual discussion with Kepnes to “hold onto the spirit of the second book”. The second season will also delve more into Joe’s background and childhood trauma – so we can understand why the hell he’s become the crazy killer stalker he has. “Joe was taken in by a guy who had a certain type of life philosophy that really did rub off on Joe. Joe was already a teenager by the time he even met Mr. Mooney. There’s a lot more to explore about Joe from earlier in his life. Those are the things we’re starting to get into for season two,” Gamble told The Hollywood Reporter. When will YOU‘s second season drop? Although we don’t know the exact start date of season two yet, it will likely be dropping in the US during their autumn – around September.